Did you know that flooding is the most common natural disaster in the United States, and that every stream — no matter the size — is at risk of flooding? Flooding near man-made structures and development can have devastating results. The floodplain of a stream is composed of the floodway and the flood fringe. The floodway of a stream includes the channel as well as the overbank areas where floodwaters are actively flowing during a regulatory flood event. It is this area that can be most dangerous. As local officials review property and proposed development projects for their community, it's imperative that they keep this danger in mind. The state has jurisdiction over construction in the floodway, but local officials are the first point of contact for many residents. When a property owner wants to build a new home or a homeowner wants to construct a storage shed or pole barn, they are typically seeking information and permission from their local planning department before they seek approval from any other entities. Since all structures in the floodplain are at risk of flood damage, local planning officials need to be familiar with these risks and keep them in mind when reviewing and discussing proposed development with a property owner. Likewise, when a community is exploring a new commercial or municipal development opportunity, it's crucial that planning and economic development officials are aware of and consider the risks involved in developing near a stream. In addition to the risks of flooding, changes in a stream’s path should also be considered. Streams are part of a dynamic system that is reflective of the watershed to which it belongs. Land changes over time, stream bank alterations, and other modifications can cause erosion, cutting at stream bends and deposition of sediments in the stream channel. This changes the flow path of streams and results in varying amounts of meander. With more development in the watershed, these changes can be exacerbated. The current location of a stream and the stream’s banks may not be where the stream will be in 10 years. This means that the perceived area associated with the risk of a stream can actually be much wider. Proper planning and floodplain management can reduce these risks. Each community that participates in the National Flood Insurance Program (NFIP) is responsible for ensuring their floodplain ordinance is followed. A community's floodplain ordinance is a useful tool, but it is not the only requirement for ensuring the community is reducing its risk of flood damage. The Flood Control Act (IC 14-28-1) applies to the entire state – whether the community participates in the NFIP or not. Even if a community does not have a zoning ordinance, the state’s Flood Control Act still applies. The regulations required by the state are minimum standards; communities can encourage or require more stringent standards such as a higher minimum elevation for structures or limited development within a stream's meander belt. Emergency management officials have a stake in reducing the risks associated with proposed development as well. Flood events mean costly disaster recovery efforts for the community and dangerous conditions for first responders. Prioritizing development locations based on their associated risk is one way that planning and zoning officials can prevent unnecessary loss. Smart planning can save headaches and money for both private property owners and the community. In addition to considering risk when looking at proposed development or construction projects, local officials can also help educate the public when development in a high-risk area already exists. The assessed value of property in a high-risk area is significantly different from the assessed value of property in a low-risk area. Similarly, flood insurance premiums can be more expensive for a structure with a lower floor elevation than another structure located in the same mapped risk area. Structures in a floodplain are subject to strict regulations that can cause significant challenges for a property owner when substantial damage has occurred or if substantial improvement has been proposed. Local officials play an integral part in helping make sure that property owners are informed. The local floodplain administrator can help by making sure the regulations are understood by property owners before undertaking a new project. Building inspectors can help ensure that new structures are built to the standards required by federal, state, and local statutes and as outlined in construction permits. Surveyors can assist in ensuring elevation requirements are met. County Assessors can provide information on the assessed value of the property. It is essential that property owners have an accurate assessment of their property and an understanding of their risk that reflects the true value of their investment. When the property changes hands, it is important that a potential or new owner receive this information as well so that they can make an informed decision about the property. Local leaders are at the front lines of education and outreach. Because the issues associated with flooding are wide, multiple officials need to be familiar with the impact floodwaters can have so that they can plan and act accordingly. While state and local floodplain regulations exist, multiple resources and players are needed to adequately educate the community on the dangers of flooding. Public officials are trusted to serve the citizens of a community and to keep the interests and safety of the public a priority. Not all property owners will fully understand the true risk of purchasing property in the floodplain. Not all property owners will understand the ways that changing the landscape can impact property upstream and downstream of their project. The more property in high-risk areas are monitored, the regulations and risks associated with development are explained, and opportunities for responsible planning are provided, the better the community will be served and the stronger our communities will be. The DNR Division of Water is interested in collaborating with local officials and reinforcing partnerships so that we can be an effective resource for local officials. Contact Alysson Oliger, compliance coordinator at the Division of Water, at aoliger@dnr.IN.gov or (317) 234-1097 to discuss potential training opportunities. We look forward to working with local officials to help create a more knowledgeable public and to help strengthen our communities. In our last issue of Waterlines, we described the basics of the Community Rating System (CRS). Now we will explain the process to enroll your community in CRS. Participation in CRS is voluntary. If your community is in full compliance with the rules and regulations of the NFIP, you may apply. If your community has not had a Community Assistance Visit within the last two years, our staff will schedule a visit with your floodplain administrator. There’s no application fee, and all CRS publications are free. Your community’s chief executive officer (your mayor, city manager, or other top official) must appoint a CRS coordinator to handle the application work and serve as the liaison between the community and the Federal Emergency Management Agency (FEMA). The coordinator should know the operations of all departments that work directly or indirectly with floodplain management and public information. Also, the coordinator should be able to speak for the community’s chief executive officer. The first step in the application process is to obtain a copy of the CRS Application, which contains all the instructions and procedures needed for preparing and submitting your community’s initial application for a CRS classification. The CRS Application includes easy-to-follow worksheets, providing credits for activities your community may wish to undertake. The CRS Application also identifies the docu-mentation you must submit to support the credits you are requesting. You may also want to order a copy of the CRS Coordinator’s Manual, which describes the program in full and provides specific information, including eligible activities, required documentation, and resources for assistance. Your designated CRS coordinator should fill out and submit your application. Help is also available through the contact information below. A FEMA Region 5 representative will verify the information and determine the appropriate flood insur-ance premium discounts. To order CRS publications at no charge, email your request to nfipcrs@iso.com. Both the CRS Application and the CRS Coordinator’s Manual are also available at FEMA’s CRS Resource Center website. The Indiana Association for Floodplain and Stormwater Management will have its 21st annual conference, Sept. 6-8, at the Century Center in South Bend, overlooking the beautiful St. Joseph River. Mark your calendars. For more information about the INAFSM conference and the organization, visit inafsm.net. The theme of this year’s conference is “Celebrating a Storm of Successes, Forecasting New Challenges.” In addition to plenary sessions, conference attendees will have floodplain, stormwater, MS4, and technical track topics from which to choose. 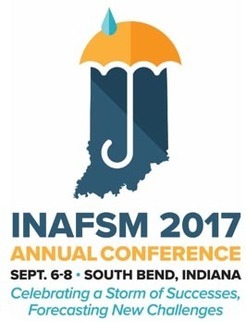 To view the agenda or to register, visit inafsm.net. Have you considered becoming a Certified Floodplain Manager (CFM)? Many companies and communities prefer applicants who have “CFM” behind their name when they have an open position that involves floodplain issues. Being certified indicates that an individual has a good base knowledge of floodplain management. The Association of State Floodplain Managers (ASFPM) has established this national program for certifying floodplain managers. The program recognizes continuing education and professional development that enhances the knowledge and performance of local, state, federal and private-sector floodplain management professionals. Because INAFSM is a State Chapter, it routinely offers the CFM exam at the annual conference. This year the conference is Sept. 6-8. A three-hour workshop covering a wide variety of floodplain topics, including National Flood Insurance Program basics, will be available at the conference for those taking the exam and those who may wish to take it in the future. Anyone is welcome. Check the agenda for times and locations on INAFSM’s website, inafsm.net. To take the exam at the upcoming conference, you must apply at least two weeks before the conference starts, through the ASFPM website. Make sure you complete the application and receive an email confirmation from ASFPM. No walk-ins will be allowed. • any other activity that might change the direction, height, or velocity of flood or surface waters. Development does not include activities such as the maintenance of existing structures and facilities such as painting, re-roofing and resurfacing roads; or gardening, plowing, and similar agricultural practices that do not involve filling, grading, excavation or the construction of permanent structures. Please visit the Indiana Department of Homeland Security’s training calendar for upcoming courses and trainings at dhs.IN.gov/emermgtngpgm.htm. 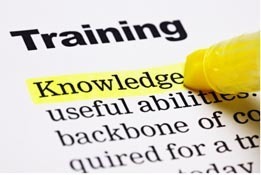 ASFPM has an online training program and training is added regularly. See www.floods.org/n-calendar/webinars.asp for more information. E0190: ArcGIS for Emergency Managers. Oct. 16-19 and Dec. 12-21, Emmitsburg, Md. This course teaches new GIS users how to apply the ArcGIS for Desktop software to support disaster mitigation, response, recovery, and risk management. ArcGIS for Desktop allows users to analyze their data and create geographic knowledge to examine relationships, test predictions, and ultimately make better decisions. Course participants complete numerous hands-on activities that help them learn to develop informative maps as well as to use tools that answer questions based on where things are located and what is known about them. It also develops a variety of skills that can be used to create, edit, manage, and analyze both spatial and tabular data. While this course does not provide hands-on instruction specifically on Hazus-MH, all activities use Hazus-MH inventory and analysis outputs. E0273: Managing Floodplain Development through the NFIP. Dec. 4-7, Emmitsburg, Md. This is a basic NFIP four-day course that lays the foundation for working with the NFIP application within the field, and is targeted for local, tribal, state and federal floodplain managers. Topics covered include outreach, mapping (risk determination), rules and regulations, permitting, elevation certificate, substantial damage and substantial improvement, flood insurance and legal issues, as well as other important topics. E0278: NFIP/Community Rating System. Sept. 11-14. This course covers the CRS, a nationwide initiative of FEMA’s National Flood Insurance Program. It describes activities eligible for credit under CRS, how a community applies, and how a community modifies an application to improve its classification. EMI also offers many more courses in Emmitsburg, around the country and through webinar training opportunities online. For additional information on EMI classes and webinars, please visit EMI’s training calendar website and its course catalog. Save the date! On March 13, 2018, the DNR Division of Water and the Indiana Department of Homeland Security will co-host the eighth biennial Operation Stay Afloat Conference in the Conference Center at the Indiana Government Center South Building, 402 W. Washington St., Indianapolis. The conference is in the initial planning phase. This is a one-day conference you won’t want to miss. For more information, check dnr.IN.gov/water, or contact Darren Pearson at dpearson@dnr.IN.gov. Thanks to those contributing to this issue: Debbie Smith, Anita Nance, Nick Werner, Don Kaczorowski, Ed Reynolds, and Alysson Oliger. The work that provides the basis for this newsletter was supported by funding under a cooperative agreement with the Federal Emergency Management Agency. The author and publisher are solely responsible for the accuracy of the statements and interpretations contained in the publication. Such interpretations do not necessarily reflect the views of the federal government. Waterlines is produced biannually as a public service by the DNR Division of Water. Waterlines is available on the web at dnr.IN.gov/water.